There are 7 Memory Care Facilities in the Ormond Beach area, with 3 in Ormond Beach and 4 nearby. The average cost of memory care in Ormond Beach is $3,200 per month. This is lower than the national median of $4,650. To help you with your search, browse the 23 reviews below for memory care facilities in Ormond Beach. On average, consumers rate memory care in Ormond Beach 4.0 out of 5 stars. Better rated regions include Port Orange with an average rating of 4.4 out of 5 stars. Caring.com has helped thousands of families find high-quality senior care. To speak with one of our Family Advisors about memory care options and costs in Ormond Beach, call (855) 863-8283. 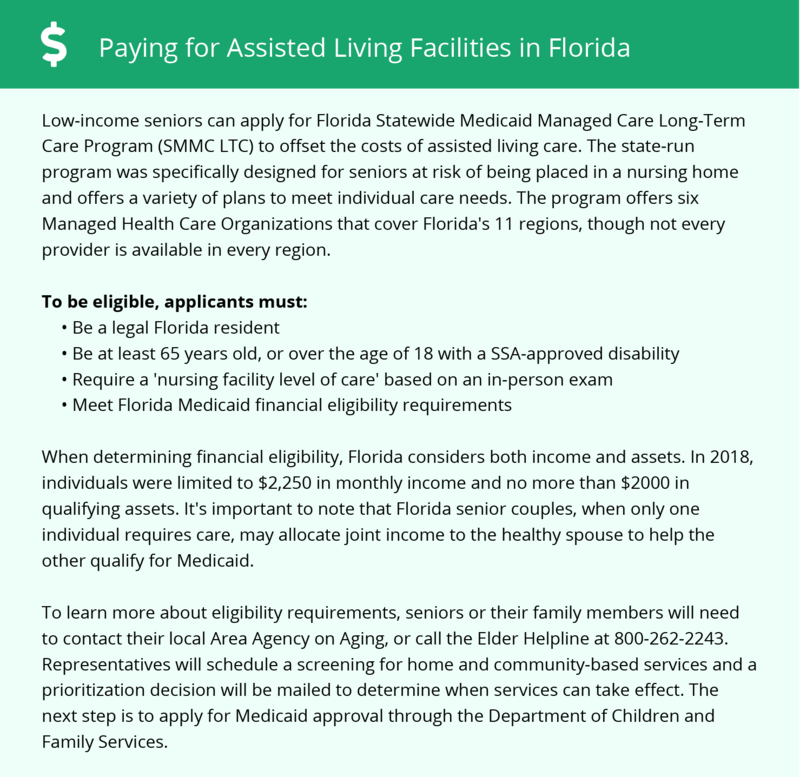 With 540,000 seniors in Florida living with a memory related illness like dementia or Alzheimer’s disease, the state has implemented regulations for memory care within their assisted living facilities. Ormond Beach alone is home to over 12,000 seniors age 65 and over, some of whom may need memory care services. In Ormond Beach, there are 28 assisted living facilities that are known as dementia care facilities. These facilities are equipped with safety mechanisms to keep their residents safe and 24-hour support. Residents of Ormond Beach enjoy a coastal setting with a tropical climate. The summer months can be muggy with a July high average of around 90 degrees. Winter is ideal for those who dislike the cold and snow with January lows of only 47. The air quality is excellent in Ormond Beach. Families of seniors with respiratory illnesses can rest assured that their loved one's lungs are not at risk from polluted air. The American Lung Association gave Ormond Beach in Volusia County high rankings in two different categories. Ormond Beach, as in the rest of Florida, is a tax-friendly place for retired seniors. Public and private pensions are not taxed, and neither is social security income. The state’s marginal tax rate is zero, which can be a big help to families of seniors who need to pinch a few pennies. Those who are looking for a memory care facility in Ormond Beach should ensure that security measures are in place to deal with the areas elevated crime, and to keep seniors from accidentally wander outside. Crimes such as robbery and vehicle theft are elevated here, a little more 10 percent higher than average. Memory Care costs in Ormond Beach start around $3,200 per month on average, while the nationwide average cost of memory care is $4,800 per month. It’s important to note that memory care rates in Ormond Beach and the surrounding suburbs can vary widely based on factors such as location, the level of care needed, apartment size and the types of amenities offered at each community. Ormond Beach and the surrounding area are home to numerous government agencies and non-profit organizations offering help for seniors searching for or currently residing in an assisted living community. These organizations can also provide assistance in a number of other eldercare services such as geriatric care management, elder law advice, estate planning, finding home care and health and wellness programs. To see a list of free memory care resources in Ormond Beach, please visit our Assisted Living in Florida page. Ormond Beach-area assisted living communities must adhere to the comprehensive set of state laws and regulations that all assisted living communities in Florida are required to follow. Visit our Memory Care in Florida page for more information about these laws.